Holy guacamole! Either the world has ended or I am dreaming. Whatever reality this may be, the "Coming Out of Their Shells" album is now available for digital download through iTunes or Amazon.com. 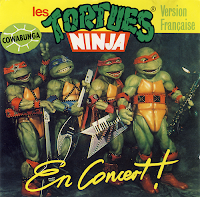 Yes, fellow Turtles fans, this is the infamous stage show soundtrack previously only available on cassette from Pizza Hut back in 1990. Back then, that cassette could be had for less than $4. Now, for less than $10, you can get all 10 songs as high-quality MP3s. But hey, they extra $$ is totally worth the convenience of not having to fast forward through all that empty space at the end of "Pizza Power," or ever having to flip sides. Download it and add it to your phone and/or MP3 player today! Then turn up the volume and put it on repeat! Once again humoring my love for the old TMNT Coming Out Of Their Shells Tour, with the help of my pal gobo I recently acquired a CD of the French-language version of the infamous TMNT concert tour. And because I'm a giving person, I'm also sharing it with you. Enjoy! The second entry into the "Video Flashback" series is a personal favorite of mine. 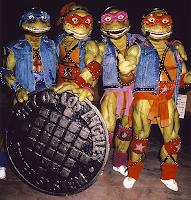 After the wildly-successful "Comin' Out of Their Shells" tour, the TMNT hit the road again in a smaller follow-up tour. This tour played in venues at amusement parks and only featured four songs, three of which were new (although the fourth song, "Sing About It," was never actually played in full in the COOTS tour). And all things considered, the songs are quite good! Laugh if you must, but I'll stand by that statement even if Shredder appears at my front door threatening to steal all of the world's music. And even more-so if he breaks into "I Hate Music." But I digress. Here is the "Gettin' Down in Your Town Tour," in three parts. Enjoy! 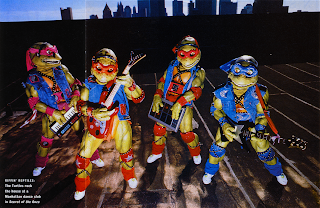 The TMNT have a rich 25 year history full of what seems to be an endless stream of interpretations. While many of these are fantastic, there are some not so fantastic bits. If you ask people about what the low lights of the past 25 years have been, there are three common answers: The third movie, Ninja Turtles: The Next Mutation, and The Coming Out of Their Shells Tour (COOTS). I actually have no dislike for any of these (my personal steaming pile of Turtle puke is Volume 4 of the comic books), and speaking of COOTS in particular, I love every ounce of it. Oh sure, it's cheesy as hell. 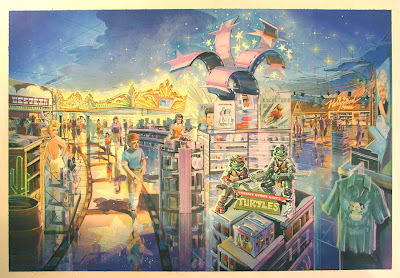 It's also probably one of the most blatantly obvious examples of Eastman and Laird "selling out" the Turtles, if you're one to accuse them of that (I, personally, am not). But damn was it a lot of fun for my 6th grade, 11-year-old self. I mean, really a hell of a lot fun. Now I consider it one of my little guilty pleasures, and I love making particular new acquisitions. So for a spot of fun, here's a look at a few promotional pictures from the tour. The first one (top), oddly, features a Los Angeles manhole cover. 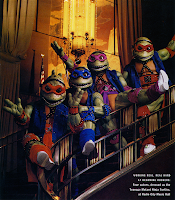 The last picture also comes from Entertainment Weekly, but this time they were massively confused about what was being written about, as it was included with a movie review of TMNT II: The Secret of the Ooze (they gave it a C+). Here is certainly one of the more obscure things I've picked up over the years. 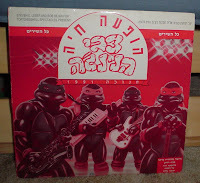 Yes, this is another foreign language edition of the Coming Out of Their Shells Tour - This time in Hebrew. Once again, I'm offering MP3s of the album for download for a limited time only. Due to my complete illiteracy in Hebrew, I had to call in some help on the translating of the track names, and even then my volunteer got stumped on a few of of the vowels (but a big thanks to oldmanwinters for at least giving me something to work with!). So the blank underscores are missing vowels. If anyone can offer more complete translations, please let me know and I'll send you a photo of the track names. However, all of the songs are completely recognizable, so providing the English titles is no problem. In addition to being a collector of obscure TMNT items, I'm also a bit of a tech geek. This means I ask for things like USB turntables for Christmas. And, having received such an item, I have now used my basic audio editing skillz to record the LP of the Spanish translation of the Coming Out of Their Shells Tour to MP3. As such, I am offering these files for download for a limited time. You can download the album here. Grab 'em while they're there! 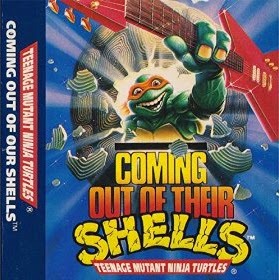 1990's Coming Out of Their Shells Tour was a huge hit in the United States, but the album also made its way overseas and even got translated for Spanish-speaking countries. 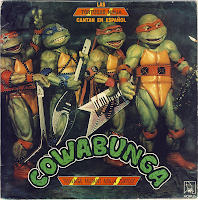 This image is of a 7" LP single of the song "Cowabunga" from the main album. The B side has a dance mix of "Count On Us" ("Cuenta Con Nosotros"). While I'm not 100% certain, I do believe this single and the Spanish-language version of the full album only got released on LP.